Disclaimer: Mind the quotation marks in the post title — I’m just reporting what one anonymous source said. Hugeasscity has no official position one way or the other on jackasses, complete or otherwise, and their alleged resemblance, real or imagined, to the honorable public servant Frank Chopp, a.k.a. the most powerful politician in Washington State. “FORGET that Frank Chopp supersized the New York City High Line project, plugged it full of program spaces from Paris’ Viaduc des Arts, and called it a solution for the Viaduct. 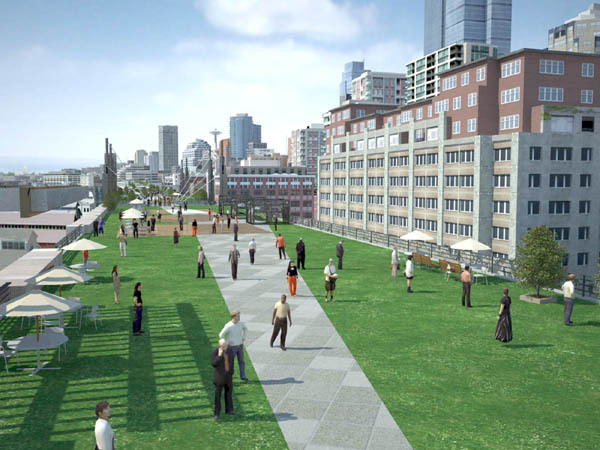 Forget that neither the High Line nor the Viaduc des Arts occupy prime waterfront real estate. Forget that the High Line is only 30 feet wide in parts and often no more than 18 feet off the ground and that the Viaduc des Arts is embraced by apartments and balconies that look onto its parkway (providing security) and interwoven with broad step sequences and ramps that provide easy access to the ground. Forget that neither the High Line nor the Viaduc des Arts block distant vistas. Forget that neither the High Line nor the Viaduc des Arts include third party program space AND an active, limited-access freeway. THEY ARE BOTH DEFUNCT RAIL LINES, FOR CRYING OUT LOUD!!! A new study by Eco Northwest found that each of the eight viaduct replacement options would have similar economic impacts. According to the study, the surface options would result in slower travel times, but because this would only affect a small fraction of total regional trips, the economic consequences are minimal. Can you feel the legs under the expensive (i.e. non-surface) options buckling? The Gehl study offers no design solutions, but that’s not surprising given that their fee was only $15,000. This whole viaduct replacement effort would be seriously energized by an inspiring urban design vision, and that means spending hundreds of thousands — still a relatively small portion of the overall budget. Lastly, some still dream (last paragraph) of a tunnel, and a recent report by the Cascadia Center and Arup suggesting that the $3.5 million estimate for the bored tunnel is inflated may keep their hopes alive. The report surveyed bored tunnels worldwide and found costs ranging from $200 to $700 million per mile. A tunnel would solve a lot of problems, though in my opinion it’s still hard to justify spending a significant amount more than the surface options to facilitate vehicle miles traveled. But oh man, you just know that the machine in the picture below would cut through all that fill on the waterfront like butter. Posted by dan bertolet on	Saturday, December 6th, 2008 at 12:50 am. You can follow any responses to this entry through the RSS 2.0 feed. You can leave a response, or trackback from your own site. 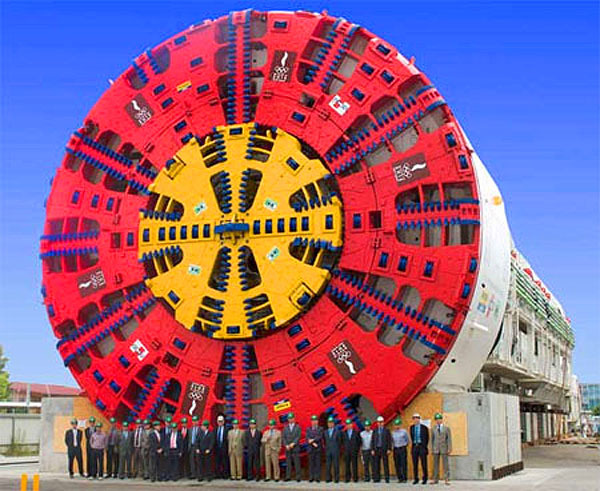 But oh man, you just know that the machine in the picture below would cut through all that fill on the waterfront like butter. I think you mean $3.5 billion. Or we’d jump at the deal. Here is the part I don’t get. I look out at the viaduct every day and I see backed up traffic, often stop and go. The surface options, even if they have the same amount of lanes (which some do not) seem like it make a bad situation worse. How can we justify putting a huge amount of traffic on the waterfront streets? I’ve seen lots of support for the surface option, but in my meager reading, I haven’t seen that question answered well. They only thing that I hear from the surface folk is that it costs less. Is that really the right tradeoff? I think the most common argument by us surface/transit option people is that vehicles trips are far more flexible then the established culture gives them credit for. People drive cars because its convenient and if its not convenient they won’t drive, simple as that. When driving is less convenient, people will do one of two things: a) choose a different mode of transportation such as cycling, walking, or public transportation, or b) eliminate the trip by combining it with others or choosing an alternative destination. And this is not just some hopeful dream of a possible situation. Its a proven fact. Take the Embarcadero in San Francisco or the Mega highway in Seoul, South Korea. Both of these roadways were removed without the devastating traffic problems that some doomsayers believed. For years we have systematically widened streets and highways throughout the region only to end up with even worse traffic congestion then when we started. I think it’s time we consider a new approach. I leave you with the words of public spaces guru Jan Gehl (and I’m paraphrasing here): cars will drive on as much pavement as you give them. So let’s stop giving it to them! I think we can put low rises throughout the new waterfront, put a ramp down from Seneca/Columbia from the old ramps and prioritize transit. Give 1st BAT lanes, drop a streetcar on Third as well and create usable transit access points. Even if we have to build parking garages. It seems the bored tunnel + surface + transit is gaining traction in an effort to form a “grand compromise”. I’m still on the fence about the bored tunnel. I’ve been a surface+transit supporter from early on, but the tunnel does have a few benefits that appeal to me. Separating freight traffic from surface traffic is a big plus, and the fact that the tunnel could accommodate transit in the future is appealing. It’s been a few years since I’ve been there, of course, but IIRC the tunnel’s N end had a grade that made it hard for laden trucks to accelerate through. Has something changed? And where would the money come from? @admin: I just have to say your website is the first I’ve come across this morning that doesn’t have spelling errors every other line. Thank you for taking the time to write something that doesn’t look like a 5th grader wrote. I apologize, just had to vent.